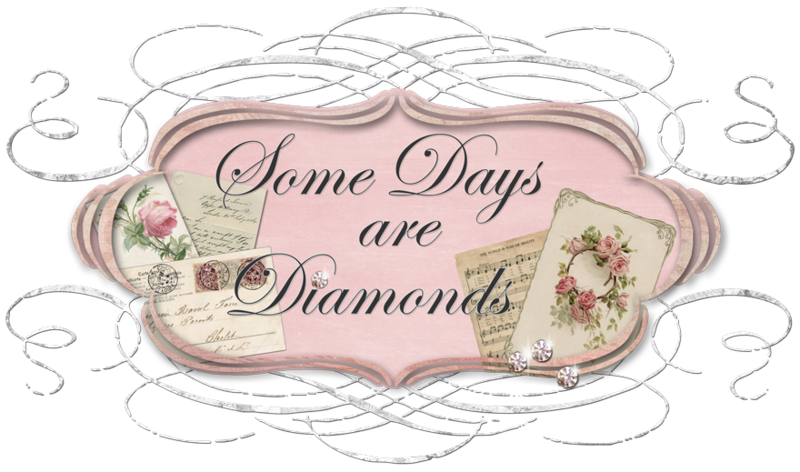 Some Days Are Diamonds: A little early . . .
A little early . . .
Have I mentioned lately that I love my mailman? As soon as he spies me running out to the mailbox, he jumps back into that little truck of his and takes off. I think he's afraid he's going to get mowed down! Here is what he brought me yesterday. And yesterday was a CRAZY day - so this absolutely made my day. I got my Tussie Mussie Swap! Now - I know, I know, I know! I'm early. I don't think we are supposed to post our Tussie Mussie Swap until May Day. But I leave next Wed and I know my life is going to be crazy hectic before I leave (ya think?) and after I get back (OMG I cannot even imagine how crazy it'll be then!) and then it's my birthday and we're going away . . . so I am posting my beautiful swap now. I have to! My partner is Patty. Her blog is Blooming In Kansas She is a brand new blogger. She is such a wonderful person. I couldn't have been more pleased to have her as a partner once I got to know her. Sooooo - wanna see what I got? The Tussie Mussie itself is so PRETTY! I love the pearls wrapped around it. And she placed a beautiful sheet of paper inside . . .
And attached a sweet little tag. I found the perfect pace to hang it in my studio. Look at the little butterfly! So sweet. And then all the wonderful little gifts to go with it. A wonderful scrapbook page kit. Love it!! And look at the adorable little lady bug chocolates! Now - I need a moment here to share something special with you. experiences with my two swap partners of late. 1980 on it. She had no clue that was the year we were married. Then for Easter she gave me a vintage ticket, with the year 1958 on it. She again had no clue that was the year I was born. to know each other, she asked me what my favorite flower was. I told her it was the Peony. But she sent me - these! Lily of the Valley. When I was a little girl, THESE were my favorite. And I did not tell her this. Don't you think that is . . . "interesting"? I can't wait to plant them next year. She also sent some yummy soap petals! And then she did the sweetest thing. She gave me the history of the Peony. And hand wrote it all out. I think this is awesome. So as you can see - I had a wonderful Tussie Mussie swap. I've made a wonderful new friend. Sigh. Blogging is just the best! Thank you Patty, this is a lovely, lovely gift. You created a wonderful package, and it was your first swap too! I'm not sure if Patty has opened her's yet, so I'll just give you a sneak peek at what I sent her. I hope she likes it. I had such fun trying to think up things that will hopefully make her giggle with glee. I must extend a big thank you to Linda from A Swap for all Seasons for hosting this fun swap. Be sure to go over to her blog on May Day and check out the BEAUTIFUL Mussie Tussie creations. She's giving sneak peeks right now and OMG! They are just GORGEOUS! Final notes - I have two of my very special friends that have had some medical issues these past few weeks. Cindy from Applestone Cottage had emergency gall bladder surgery and was in the hospital for 5 days. She is home now and on the mend but please keep her in your prayers. And my Dear Friend CeeKay has had a horrible/fabulous week. Please, please everyone, keep her in your prayers . . . Our Lord is listening!!! Praise Him! Hugs to all of you! Now I'm off to work and back to my crazy life . . . next week this time - SAVANNAH! WHOO HOOOOOOO!!!!!!!! gorgeous!!! how much fun, oh, I couldn't wait either!!! Oh my, your tussie swap is gorgeous, look at all those beautiful goodies. I got my tussie swap in the mail yesterday and just posted about it. I think I am in trouble, wasn't sure if we were suppose to post or wait until a certain day. I posted, I am a bad girl. Hi Miss Karen, You've been spoiled again and you deserve it! Isn't it fun to do those swaps? Just a few more days and your off to Savannah! Wooooohooooo! I'm all excited for you and Jodie! Well... you just hit the jackpot with your lovely swap partners. Everything is just beautiful!! I hope you have a wonderful time and I will lift our fellow bloggers up in prayer. Love that tussie mussie, it is too cute! What a wonderful gift and loads of time went into making it! Enjoy your crazy life out there my friend! Can't wait to see you next week! You taught me a new English word again! 'Tussie Mussie' sounds as sweet as it looks like. Where do you ladies keep finding these wonderful things?! I keep saying I'm going to make tussie-mussies. Because I love herbs so and they often have them in herb books, due to their popularity in Victorian times. Karen, oh my goodness, great buys there! Meeting new friends here, just pretty mind boggling, isn't it. So many wonderful friends, who knew! Patty totally spoiled you Karen!!! The sneak peek of what you sent her looks gorgeous too! So are you all swapped out by now? You've been a swapping machine lately...a mailman mow machine...a trader babe! okay...it's late and I'm getting delirious. Counting down the days to Savannah! and no...I've still accomplished nothing! Wow Karen ~ you did get some amazing beautiful things!!! Swaps are so fun! If I find a table like the one on my post (on craigslist)...I will let you know! :) Keep your fingers crossed for me! Oh those are so sweet, such lovely gifts!!! !They are wonderful, I was wondering what a tussie mussie was??? ?So I guess I know now!!! !It is a flower arrangement scrolled into a shape like a cone?? ?Right or wrong????? Have fun on your trip, I know you will!!!!! Cannot wait to hear all about it. Yes, I have been Praying for Cindy and Ceekay, I have a card for both of them!!!! Thanks for stopping by. Yes Zuzu is a doll. Love your tussie mussie swap. I don't blame you for opening it up early. All made from the heart. WOW! If I got that kind of stuff in the mail, I'd be mowing over the mailman too!! Consider me a new follower! HE did it - No SHE did it - No, HE did it! She just gets it . . .
A few songs come to mind . . .
Walkin' the halls . . .